This year, I experimented with a new approach to the performance review process as an inquiry into what it is like to perform a task that is familiar using unfamiliar tools. Our role is to add value to the experiences of our staff while they do something similar to this with technology tools. This is a take on the SAMR model, where I am modifying-reimagining the task by changing the tool I use, in this model going back to analog mode from digital and conceptualising the Lego constructions as mediating artefacts. I used a Creationary set from home for the Lego pieces, and did not modify the set or include/exclude specific pieces before I began. The first setup was difficult, as I experimented with backdrop and foreground, eventually deciding on a mindmap of learning models with the intention of aligning the pieces to the most appropriate model. That didn’t always work, but the pieces are usually close to the idea that I felt was most important to that objective. My perspective is that the majority of authentic learning is Activity System-driven anyway. I became aware how gendered the Lego I have is when I found no girl characters, but I’m not partial to gender labels anyway so moved past that realisation quickly. For each objective I built the response first, and then described the concept behind it, consciously reversing the order of events I would usually follow which is to articulate my idea first in writing and then proceed to activity. 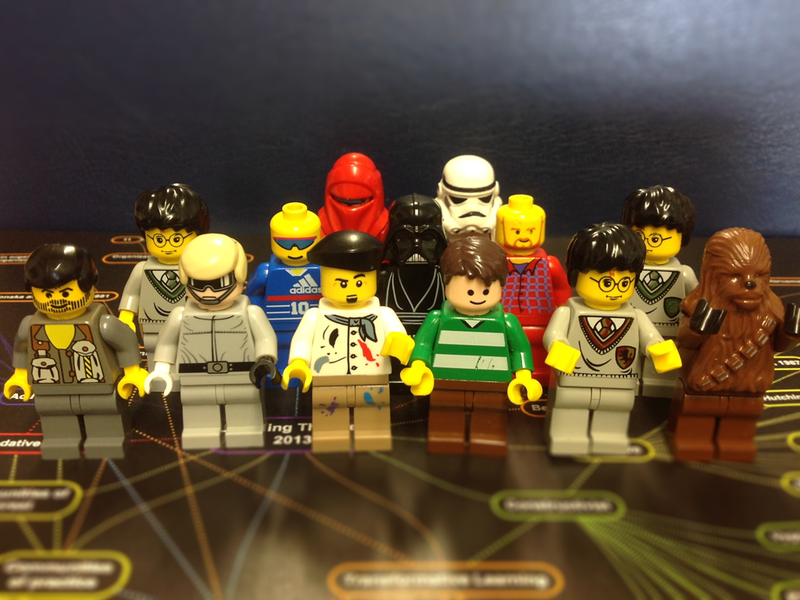 As I went through each question, characters, groups and artefacts emerged with Lego representations and something I hadn’t expected was how nuanced I could be with the visual representation – it adds another encoded layer to my responses. Completing this review in a non-traditional way was really enjoyable, and it was an excellent metaphor for the role of play in work. My state of mind during the process was lively, happy and creative, and this probably also had the effect of focusing on the positive aspects of 2014 as well as allowing deeper reflection and knowledge construction. I then took the unprecedented step of presenting the folio in a beta Microsoft product, again because it is something I would usually avoid. Yes, it was the Microsoft experience I expected in terms of anti-intuitivity, but I watched how I learned the product through trial and error and efficiently processed my images for scale and consistency with ancient production-line skills not yet dormant. Unsurprisingly, the output was both inflexible and mangled, so I chalked that up to experience and quickly processed the same text and images in PowerPoint *sigh*. At its heart, this is ‘gamification’, where self-organisation occurs because there is motivation toward the activity, and I complete it in an organic way in which the outcome is constructed through the process. My curiosity about the end result led to me giving more, and different, consideration to the questions and responses than I might otherwise, and using human-like representations helped me situate myself physically in the model and – strangely enough – enabled to self-assess. This articulation of one kind of identity, my ePortfolio focus this year and the Strategic Academic workshop have together highlighted the need for a personal ‘brand’ aligned to my online personae, and another output from this process has been a review of my digital identities and a strategy aligned to my personal and professional goals. I hope to enact this strategy in 2015 as a personal development project which will feed back in to the organisational ePortfolio work.